Bishop Theodore Mascarenhas, Secretary General of the Catholic Bishops’ Conference of India gave a clarion call to spiritual heads and guides representing different religions of India and to men and women of good will to come together and to lead the nation and the world towards peace and harmony . 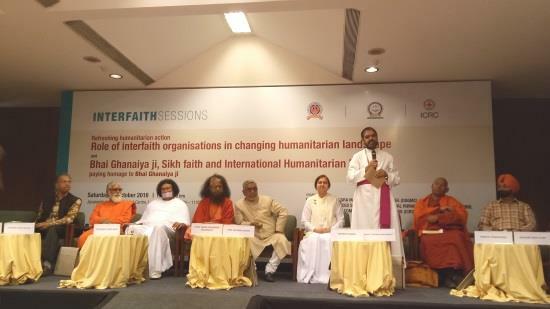 He was speaking at the India Habitat Centre, New Delhi on 27 October, 2018 at the Inter faith meeting organized by the International Committee of the Red Cross, Delhi Sikh Gurudwara Management Committee, Centre for Advanced Studies in International Humanitarian Law and Rajeev Gandhi National University of Law. The meeting was held to mark the Fourth Centenary of the death of the Sikh leader and social worker Bhai Kanhaiya (1648–1718). He was known for pouring water for all the wounded members of the battlefield no matter whether they were Sikhs or fighting against the Sikhs. Speaking on the theme, “Refreshing humanitarian action: Role of interfaith organizations in changing humanitarian landscape”, Bishop Mascarenhas lauded the Sikh community for their humanitarian works reflected in the organization of langars, providing free medical aid, conducting relief in disaster zones, providing relief in times of floods, earthquakes etc. He reminded the audience that Guru Nanak had exhorted that “Even Kings and emperors with heaps of wealth and vast dominion cannot compare with an ant filled with the love of God.” Bishop Theodore warned the people to beware of those sowing hatred and invited them to spread love instead. He said, the nation and the world required people who will bring healing and who will work for peace and harmony. We have had enough of hatred, division and injury, he said. Others who spoke on the occasion were Swami Chitananda Saraswati, Acharya Lokesh Muni, Binny Sareen, Jaspal Singh, A.K. Merchant, Bikkhu Sanghasena, and Goswami Sushilji Maharaj. The Panel discussion was moderated by Prof. Akhtarul Wasey, President of the Maulana Azad University. Earlier Sardar Surinder Singh Oberoi, Political Advisor to International Red Cross Society introduced the Programme.